The local flavour of Char Siew in Singapore usually appears in bright redish colour. Most Char Siew sellers mix red colouring to enhance redish appearance of this roasted pork. However, I opted out the colouring step as its original colour is even more alluring, to me. Coming to the Char Siew sauce part, there are so many ready-made Char Siew sauce widely available in the market. The taste of such instant sauce is good, too. However, I did not use the ready-made version. 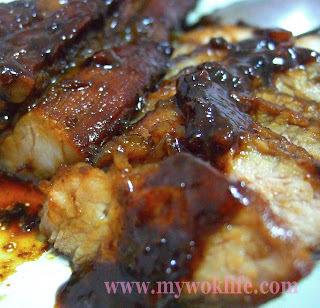 I would like to share my recipe of making Char Siew sauce here because it’s easy to make! My dad, who could cook very well (too bad, he has no time for it), handed down his recipe to me, in fact. I called this as one of the prescious heirloom recipes! It is indeed very tasty and juicy. 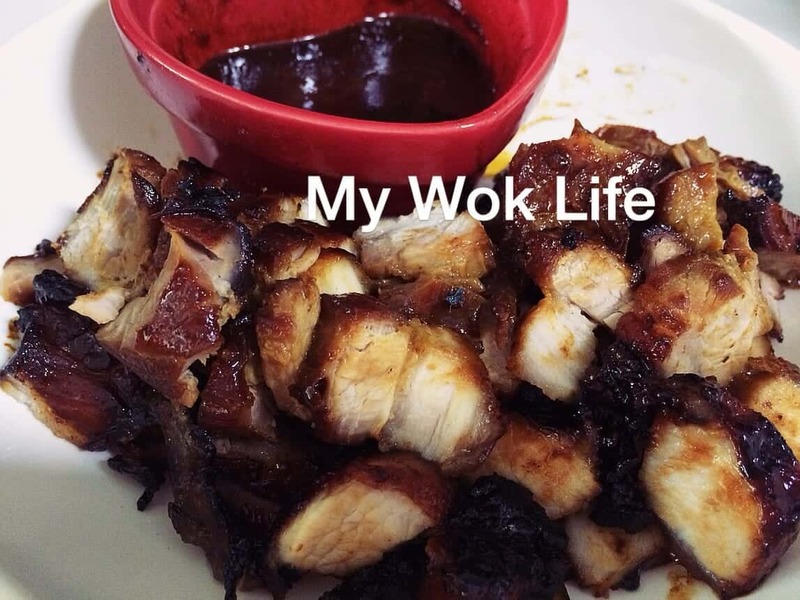 This Char Siew has a sweet-aromatic aftertaste. 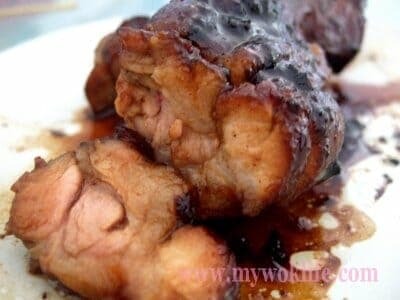 The ingredients for Char Siew recipe are simple and easily obtainable in grocery shop, wet market or supermarket. Most of the condiments used are already available at home, actually. I added Zedoary in my recipe. Not sure if you have heard about Zedoary (沙姜), it is a kind of root herb. 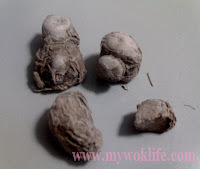 It is commonly ground into powder and to be used in Chinese cooking such as five spice braised pork meat, and baked chicken, or to be added into curry paste in Indian cuisine. This edible root of zedoary looks and tastes similar to ginger, but Zedoary has mild spice scent. It’s flavour will not be overwhelming. Zedoary normally sold in powder form and small pieces. Both types are OK to be used in this Char Siew recipe. I’ll use any form depends on its availablity at that point of time. We can easily get it from Chinese/ Eastern medical shops, and even Indian spice shop. I like to use Zedoary because it’s mild, and to aid digestion, a relief for colic, and act as its blood purifying agent. Anyway, do not get worried if you still can’t figure it out, or might have difficulty for getting one. Use ginger juice instead, since it has similar taste to ginger. To make ginger juice, blend or finely chopped 1 small piece of ginger, and then squeeze juice out. Either of these makes delicious Char Siew dish! 1) Cut pork into 2 long strips, if not yet. Place them in a large bowl. 2) Combine well with all seasoning ingredients. Dredge pork strips with the seasoning mixture, and marinate for 1 – 2 hours. 3) Preheat a large wok/ saucepan over medium fire, place strips into the hot wok. Keep remaining marinating sauce in the bowl for later. 4) Roast pork strips for 10 min each side, or until both side are caramelized (glazed) and well roasted. Remove from wok. 5) Put marinating sauce into the wok, add some water in order to yield more amount if sauce, and bring to a boil. Reserve it as Char Siew sauce for later. 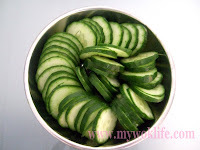 6) Thinly slice pork strips when they are cooled, and serve with Char Siew sauce, and sliced cucumbers. 1) Preheat oven to 200ºC. 2) Line baking dish with aluminum foil, and place pork strips on it. Do not discard the marinating sauce, but put it in a bake-proof ramekin. 3) Place baking dish in the center of preheated oven. 4) Bake one side for 10 minutes. Turn pork strips over and bake for another 10 min, or until caramelized. Place marinating sauce in ramekin into oven to cook for the same 10 minutes, after flipping over the meat. 5) Remove roasted pork and sauce from oven. Thinly slice when strips are cooled. Serve with Char Siew sauce, and cucumbers. 1) Marinate meat as usual, except for honey. Pre-heat air fryer at 180deg Celsius for 5 minutes. Place marinated meat onto the wire mesh basket and air fry for 10 minutes. Do not discard the marinating sauce, but put it in a baking-proof ramekin or any bowl that can stand heat. Seat aside for later. 2) When first 10 minutes air-frying is done, open air fryer, turn the meat over to air fry for another 8 minutes. 3) Then, increase temperature 200deg Celsius. Brush honey and continue to air fry for 5 minutes. When done, turn meat over, brush honey and air fry for another 5 minutes, or until meat is roasted with some char-burnt edges. 3) Remove roasted Char Siew meat from air fryer. Place the sauce in ramekin onto the same wire mesh basket to cook at 160deg Celsius for 10 minutes. When Char Siew is slightly cooled, slice and pour sauce to serve. This dish takes about 20 min (exclude marinating time) to complete and serve. If you are preparing it for next day dinner, marinate pork the night before. Store it in the refrigerator. A delicious dinner of homemade Char Siew awaiting you and your family! I never forgot to remind you on the calorie-count. It yields 250kcal for a decent portion of Char Siew meat. Shoulder cut pork meat loads you with lesser calorie as compared to belly pork. I like to use shoulder part for its tenderness, too. Of course, some like the fatty part most. The choice is yours. Tips: Do not heat wok with oil. Place pork strips directly on the dry hot wok, for better caramelizing effect. *Do not over-roast or bake the pork in order to retain maximum tenderness and juiciness of the meat. *Dredge pork strips with the seasoning mixes during marination to intermingle meat and the sauce further. * You may adopt the same honey-brushing method into stove cooking and oven baking as air-frying. This way is the best to prevent easy burning of the main part of the meat. Also to yield shinny appearance of the Char Siew. * There might be some aromatic meat juice and oil emanated from the roasting and left in the pan/ baking tray/ air fryer, do not discard it. 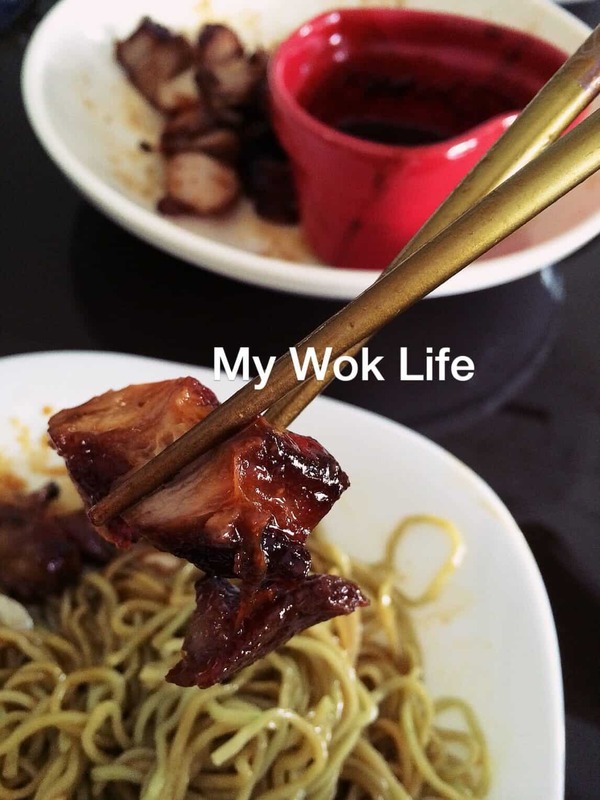 Pour it out to drizzle on the Char Siew. * You may wish to line baking sheet or aluminum foil on the wire mesh basket to prevent sticking. However, the downwards facing part of the Char Siew might get a little bit wet from the juice retained in the foil. Hence, longer air-frying time might be needed. Extend a couple of minutes longer, then. Wow. so many simple and delicious looking dishes. Wonder how you keep so fit eating all these. Tried the recipe using sauce pan, and it was Delicious! Below , may I ask cook for how long please..
3) Preheat a large wok/ saucepan over medium fire, place strips into the hot wok. Hi, it takes a while to achieve the nice browning with some burnt edges. I remembered roughly 30-40 minutes. Just keep cooking until the desired char siew outlook and color effects as your basis. Hi Patricia, tried the air fryer method and result is good but any tips on cleaning the air fryer tray n basket? Hi Serene, get the long handle brush from Daiso for just $2. It makes it a lot easier to wash the stain and sticked food off the mesh.